For decades, video games have sought legitimacy. A standard foundation upon which an entire artistic medium can be built. A basis for serious thought, criticism and consideration that many people within the industry often feel is lacking, no matter how much posturing they do. Going by the history of video game acting, It's the kind of legitimacy that only a SAG minimum and a down-on-their-luck Thespian can truly provide. The language of games and cinema are pretty closely intertwined these days. Games are a young medium, and like how early film directors and cinematographers looked to radio plays and theatre for inspiration before figuring out what worked best in their unique mediums, designers often ape cinematic tricks and tropes while they work out what only interactive media can accomplish. It's why cutscenes exist, really, to get across story beats the way a movie would, rather than find the far more complicated way to convey an idea simply through gameplay. And within those cutscenes, we find the actors hired to bring them to life. Often times these actors are brought in as that legitimacy. They come from an established, respected medium, and presumably, someone in charge of the game's direction figures they can lend some of that respectability to their game. The problem becomes that usually, actors in games just end up being in bad movies, delivering stilted dialogue in awkward cutscenes. Here are five of the weirdest intersections of Hollywood talent, and bad decisions in game casting. The trend of dropping actors into games didn't necessarily start with FMV games, but they're certainly the best early example. When the technology to digitize real actors came around, there was an absolute mess of games looking bank on Hollywood talent for sales. We'll be revisiting 1996 later on this list, but for now, let's revel in the absolutely timely weirdness of Parroty Interactive's Myst parody game, Pyst. It's the kind of game that could literally only exist in 1996. One year after Myst came out; it was easily the most popular PC game in the world, and people were already getting onto blaming it for the death of adventure games. Meanwhile, dozens of games were trying to copy its blend of 3D enviroment puzzles and FMV cutscenes. And then there was Pyst. Ostensibly a parody game, there isn't really much to Pyst. John Goodman plays King Matruss, who pops up in live action cutscenes to crack jokes and sing a song about how the island of Myst was turned into a dumb by the thousands of people who went around solving its puzzles. Seriously, that's the concept. Everyone who played Myst was a tourist, and now the king is titularly "pyst" about it. There aren't any puzzles, so it really is more of an "interactive movie". In a weird way, it's more of a predecessor to modern indie games like Gone Home and Dear Esther than even Myst is. The game is entirely about learning more about the story, making it a strange bedfellow for having a (relatively) big name TV actor for the time. It's a bizarre concept with even more bizarre jokes, but somehow, it technically leveraged the medium better than most games selling themselves on a famous actor. Christopher Walken, pictured here in what I assume are his pajamas. Let's stick around in 1996 a bit more before we jump ahead. Ripper is a vaguely cyber-punk murder mystery, that not only billed itself on its Christopher Walken-led cast, but also on the fact that it was "different" each time you played. Taking the language of cinema, it's a movie you can watch again and again, since the villain is selected at random when you start, which changes up a few clues and puzzles. Generally speaking, people like to play games again and a gain because they enjoyed the gameplay, and rewatch movies because a good movie doesn't have to be different every time, it's just good. It's a strange cross between the two to have a movie that goes differently each time, but it does show a certain level of lateral thinking about what you can do with games that you can't with movies (Clue aside). Christopher Walken doesn't know what you did, but he can find out, and he'll be very upset. It's too bad the rest of the game doesn't really hold up to that. Ripper would be an absolutely mediocre, forgettable adventure game, if it weren't for the unbelievable performance Walken gives as Detective Vince Magnotta, a loose cannon cop and potential villain. Every line Walken spits out is either too fast, too slow, or so incomprehensible, it seems like it was funnelled through an alien Google Translate before being written down in English, all with Walken's trademark goopy delivery. It's sort of the microcosm of everything wrong with that era of FMV games. They got a big name on board (plus the rights to play Blue Oyster Cult's Don't Fear the Reaper, which must have really been a timely treat in '96 and is mostly just grating now), but lacked the behind the scenes talent that makes actors so watchable. There's a real lack of great voice direction in games these days, leading to awkward deliveries like this, but it always looks worse when it's a big-name actor spitting out lines like they've never even heard of speaking before. I will complain about how terrible Kingdom Hearts is to the end of time, and I'll STILL think this is a really cool poster. Damn you Nomura. This is where we step out of the realm of live action actors (for a bit anyway) and into voice acting. There was this period in the mid-2000s where more traditional games made a big deal of advertising their voice cast- or at least, the big name headlining their voice cast. Kingdom Hearts was at the cutting edge of that trend, with a cast composed entirely of early to mid-2000s TV actors and an army of veteran voice actors to replace the real celebrities who wouldn't come back to voice their classic Disney roles. So young, so innocent, so guaranteed to be affordable when Kingdom Hearts 3 comes around. Sure, a couple of stars made their comebacks. Gilbert Gottfried still plays Iago, and Ming-Na Wen comes back as Mulan, but a Jeremy Irons-less Scar performance is a pretty dull prospect, and it's just weird hearing anyone but Johnny Depp smarm around as Jack Sparrow, now matter how accurate the impersonation might be. Meanwhile, the core cast of Kingdom Hearts is filled out by Hayley Joel Osment as Sora David Ghallagher as Riku, and Hayden Panettiere as Kairi, which were some impressively forward looking choices in terms of "young actors who will be cheap when we need them for a sequel". Kingdom Hearts doesn't have a terrible voice cast, all told, it doesn't even have notably bad voice direction. It just happens to have this strange mishmash of a cast, owing to being both a Disney property (and requiring soundalikes of various celebrities who were in the original movies) and a Square Enix property (and requiring the most anime voice actors money can buy). It's the only thing I can think of where John Dimaggio and Christopher Lee share a credit. It's certainly amusing that none of the younger actors who voiced main Kingdom Hearts characters ended up really taking off, cursing them to be stuck voicing anime preteens trapped in a recursive hell loop of shadowy organizations and ridiculous, unpronounceable names like Xenmas, but Kingdom Hearts is oddly representative of a time gone by in gaming, a time when you could hire Jesse McCartney to voice one of your characters and it was a legitimately big deal. Beyond: Two Souls features the most realistic Ellen Page experience available on modern consoles, at least until PageQuest: The Halifax Hunt. And finally, taking us to the present, is David Cage's latest. Cage is am an enamoured with the concept of an interactive movie, and strives to make all his games as cinematic as possible. It's sort of amazing then, that it took him three whole games to finally cast Hollywood actors as his protagonists. I'll stop using this image when it stops being hilarious EVERY TIME. 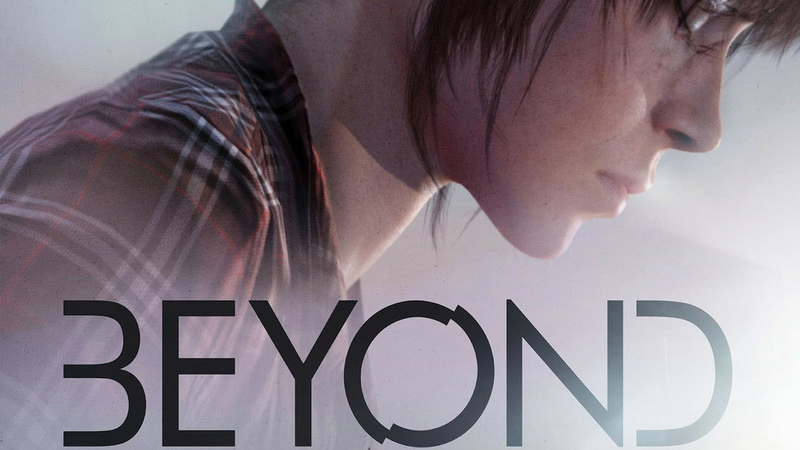 Beyond: Two Souls stars Ellen Page as Jodie Holmes, a young woman who can communicate with a mysterious psychic entity, and Willem Dafoe as Nathan Dawkins, a doctor tasked with studying her. In traditional David Cage fashion, the story doesn't really make too much sense, but it's not really the point. Cage's games are designed in such a way that intends to elicit the same reactions that cinematography tricks do, but with game mechanics. Specifically, Cage's more recent games involve the use of motion control to simulate action, and, at least in his previous title, Heavy Rain, used player choices to make them feel as if they had control of the narrative's trajectory. Beyond doubled down on the "cinematic-ness" by actually utilizing Hollywood talent. Of course, separated by almost a decade from when that was in vogue with games like Kingdom Hearts, a game starring Ellen Page and Willem Dafoe was more of a novelty than it was a big selling point. And yet, their names were plastered all over the poster, with promo materials showing off the pair in full motion capture suits to really hammer home exactly how involved in the process they were. Strangely enough, the most accurate Willem Dafoe experience available on modern consoles is Bayonetta 2. Who knew? The implication then, seems to have been that Page and Dafoe weren't in the game because Hollywood actors sell better, as it was with Kingdom Hearts and Ripper, but that their presence lends the legitimacy of cinema to something that's "just a game". They aren't just actors for promo materials, but they're involved with the creation of the work, just like we imagine actors to be involved with the movies they're in. It's evolution in full circle, back to the original idea of "borrowing" the language of film to prop up a still developing medium. The difference is that games seem to have outgrown that instinct. Very few games make a big deal of their celebrity talent these days. Even Keifer Sutherland turn as Big Boss in Metal Gear Solid V has become less about his performance and more about how he isn't the previous actor, David Hayter, somebody primarily associated with games. From FMV games, to high-budget voice casts, to faux legitimacy, Beyond: Two Souls' use of Hollywood talent represents just how far games have come. Selling a game based on the actors in it used to be embarassing because it looked ridiculous, now it just makes you look like you don't know what you're doing.